Get ready to enjoy the Tropics with your closest friends and family. Our Partial Water View Three Bedroom Villa feature a large guest room on the ground floor offering a white sand terrace, beautiful partial water view porch, and two plush queen size beds. Access the villa from a flight of stairs, ascending into the lush treetops, with the master bedroom on the second floor and the third bedroom on the third floor. 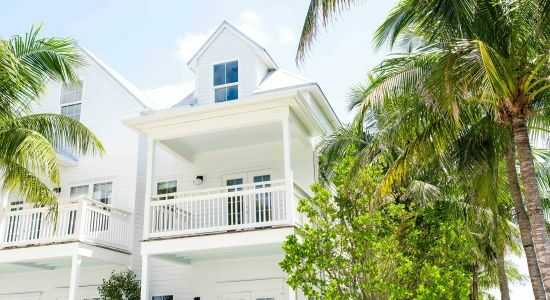 This three-bedroom Key West villa features property-wide Wi-Fi and offers both privacy and ample shared space for family or friends traveling together. Each villa features a foyer with separate doors to the ground floor guest room and the second and third floor suite.